We here at Magnificent Moments Weddings have had the pleasure so working at some pretty breathtaking venues. Some that are so gorgeous they are just too good not to share! 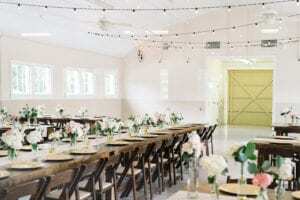 Today our Venue Spotlight will focus on The Dairy Barn at Anne Springs Close Greenway. Anne Springs Close Greenway is an extensive protected natural area in Fort Mill, South Carolina. The Greenway boasts thousands of acres full of forests and pastures that include trails for hiking, biking, kayaking, and horseback riding – a perfect place for weekend family fun. 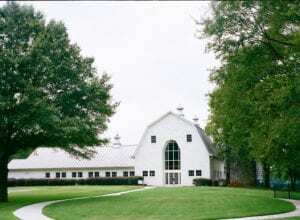 But the site also includes an amazing wedding venue, The Dairy Barn. The Dairy Barn is just as its names describes, a vintage barn that was built in 1947 to house dairy cows. However, in recent years it has been renovated to become a spectacular event space. The two-story white barn has amazing windows to let in some of the most gorgeous light you have ever seen. The upstairs loft is the perfect space for your ceremony and the downstairs barn can hold up to 200 people for your seated reception. Not only is The Dairy Barn a beautiful place but it is full of beautiful people. 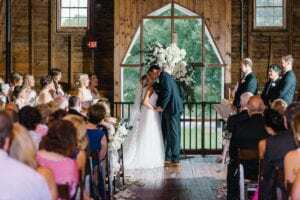 We sat down with Venue Sales Manager, Katie Suddreth to find out more about her, weddings, and this awesome venue. If your looking for a venue for your big day definitely check out The Dairy Barn, we know you will love it and the people that make these amazing events come to life there just as much as we do!